You can visit the US Navy Museum at the Washington Navy Yard in Washington, DC. The first exhibit that will strike you at the US Navy Museum is the Destroyer USS Barry DD-933. It's a good looking ship that you can board and tour. The sections of the Barry that are open for tours are in very good shape. Also outside is one of the two Swift Boat PFCs said to be on display in the US. This is the same type of boat Senator John Kerry served aboard in Vietnam. A very rare large 14" Naval Railway gun is also on the grounds, but I could find little details on its use or specifications. 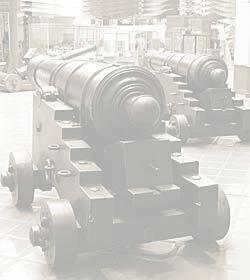 A number of early cannons dot the grounds along with a 16" battleship barrel and a section of 26" armor plate that was to be the front upper corner of the 18" main gun turrets used on of WWII Japanese Yamato class battleships. There is also a deck gun and spare propeller blade from the US Battleship USS Maine which was sunk in 1898 in Havana Harbor, at the time attributed to a mine attached to the hull. That event proved to be a catalyst for the Spanish American War. More recently in the late 70s an investigation included it was more likely that it was a coal dust explosion that sunk the USS Maine. Inside the museum are more early cannons and artifacts and a mockup of a section of the US Constitution. An F4U Corsair and Japanese Ohka Suicide Bomb hang from the ceiling, along with the deep sea submersibles Alvin and the Trieste Bathyscaphe. A number of bombs, depth charges, torpedoes, and mines are on display, along with a variety of small arms from US and Japanese armed forces. A 3" naval gun mount was open to visitors who wanted to sit in the gunners seats and elevate and traverse the barrel by hand crank. A number of extremely well done ships models are on display in the museum building including a large cutaway of a WWII Destroyer. There was a good deal more than that on display, and a good number of informational placards with more details on individual exhibits. The staff on board the USS Barry were very friendly and quick to answer questions and knew the Destroyer and its history well. The staff inside the museum itself were not as knowledgeable and could offer no details on the 14" Railway Gun on the grounds, but I may have just asked the wrong people. The US Navy Museum recommends you call ahead a day or more before visiting the museum as it is within the grounds of the Washington Navy Yard, an active military base. Check the Navy Museum's Website for hours and details. When you enter the base, you are directed to park and go inside to present your photo ID drivers licence or passport, car registration, and insurance card after which you will be issued a pass to get to the museum. Security is tight and security is on the ball as I found when I made a wrong turn walking to the museum from the parking area and was stopped and asked for ID and Pass. Probably because of that there were not many visitors that day. Admission and parking were free. There is a good commissary on the base a few hundred feet from the museum which was pretty good and prices were reasonable. There was a choice of several chain fast food concessions in a converted old shipyard/factory building which was rather nicely done. The US Navy Museum is a good place to spend a day in DC, especially if you want to avoid the crowds. I'd recommend going by car as friends in the city pointed out that the area outside the base is pretty run down and I have to say they were right. Interestingly of all the people I met during my week of visiting DC, only 2 had heard of the US Navy Museum and none of those I met that live in the city had visited it.